Villa Sarniç has all the ingredients for a relaxing holiday. Situated in a quiet location, this villa has views across the Taurus Mountains and Kalkan bay, yet it's still within walking distance of Kalkan town, harbour and beach. There are sea views from all 3 levels, as well as from the large 10 metre private pool and sun terrace with built-in BBQ, the large first floor balcony, and the roof terrace. Inside, this fully air-conditioned villa has 3 double bedrooms all with balconies or terrace access, 3 marble bathrooms, including a jacuzzi bath in the master ensuite, a fully-fitted granite kitchen, spacious lounge and laundry room. The villa accommodates six people comfortably, and is a short walk from a mini-market, greengrocers and traditional Turkish cafe. All bathrooms are tiled in marble. The stylish and spacious open-plan living room has a 3-seater sofa, 2-seater sofa, 2 armchairs, dining table, satellite TV, DVD, docking station, internet access and patio doors to the pool terrace, affording fabulous views of the bay. The modern kitchen has a granite worktop and is fully equipped with fan oven, fridge/freezer, hob, dishwasher, microwave, toaster, kettle and coffee machine, plus all utensils, glasses, cutlery and crockery. There is indoor dining for 6 people plus a shaded outdoor table for al fresco dining. The pool is larger than average for a villa of this size, at 10 x 4 metres, with a regular 1.5 metre depth. There is also a poolside shower. The master ensuite benefits from a jacuzzi bath. 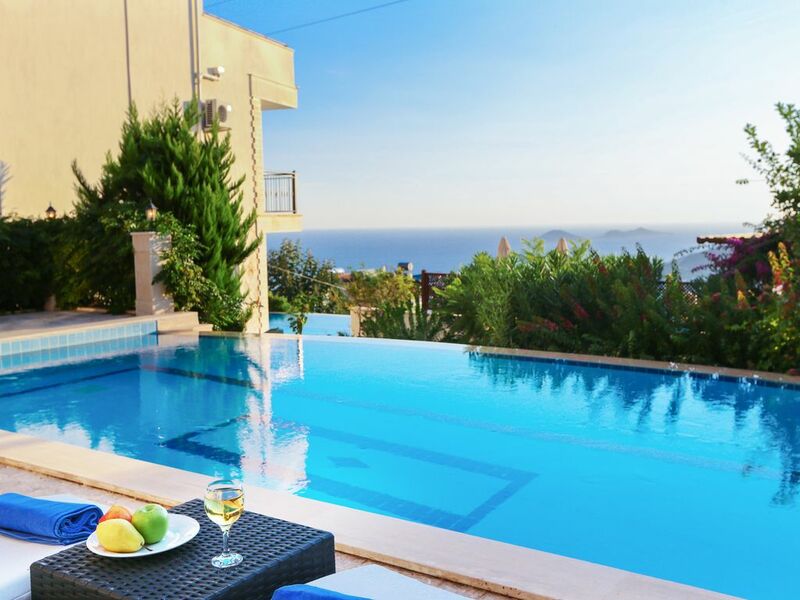 The villa is within easy distance of Kalkan's attractive beach. The town also has 7 beach clubs in stunning locations. Alternatively, a 10 minute dolmus ride (local minibus service) will take you to beautiful Kaputas beach, or a 20 minute ride takes you to the famous Patara beach with its 18km of pure white sand. Patara beach, set in a national park, has been voted one of the Meds most beautiful and undiscovered beaches. The nearest airport is Dalaman (approx 1.5 hour drive) and flights are direct from the UK. Transfer to and from the airport is usually by private taxi or minibus. We can arrange transfers and car hire from Kalkan at very reasonable prices. Kalkan town centre is a 5 min drive, approx. 15-20 min walk. Kaputas beach, 10 min drive. Patara beach, 20 min drive. Kas, 30 min drive. Fethiye, under 1 hour drive. Other local attractions are easily accessible, such as Xanthos (the ancient capital of Lycia), the sunken city of Kekova, the ghost town of Kayakoy, the rock tombs of Tlos, Demre and the Church of St Nicholas (Father Christmas), the mountain villages of Islamlar and Bezirgan, and Saklikent Gorge. Daily boat trips are also available. The idyllic town of Kalkan on Turkey's dramatic Lycian coastline nestles in the Taurus Mountains above a small, picturesque harbour. Its enchanting narrow streets lined with small shops, local restaurants and listed whitewashed houses with shuttered windows and carved timber balconies tumbling with bougainvillea, twist down to an ancient harbour. From here, overlooked by a tiny white mosque, the fish are brought ashore in the morning and the wooden gullets sail out on their day trips around the bays and outlying islands. The climate in Turkey is similar to southern California, and the sea is the colour of turquoise. Whether you want to relax by your own pool or on sun-drenched beaches, visit ancient sites, shop at bargain prices for real gold jewellery or fake designer labels, there is something here for everyone. There is also a good range of sports available, including: diving, snorkelling, water-skiing, jet-skiing, windsurfing, sailing, horse riding, sea cayaking, canooing, paragliding and more. For food lovers, Kalkan offers some of the best food in Turkey, either from its traditional locantas, the harbour-front restaurants, or on the romantic roof terraces for which Kalkan is famous. Or visit the trout restaurants of Islamlar, the mountain village above Kalkan, where the trout pools are fed by mountain springs. Kalkan is a friendly, picture-postcard pretty, town that despite its increasing popularity and sophistication has retained its charm. No wonder so many holiday makers return to Kalkan year after year. Changeover Day: Chngeover day is flexible. Arrival time at the villa is 3pm and departure time 12am, although we will be flexible wherever possible.